This is a very quick and simple no bake dessert cake. 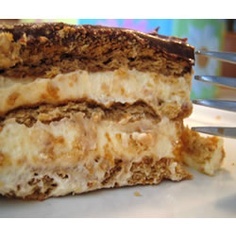 It uses graham crackers and a pudding mixture. It tastes just like an eclair, but there is enough for a crowd!! It is a great recipe for children who are learning to cook, there is no baking involved or any power kitchen tools. Just a bowl and a spoon! In a medium bowl, thoroughly blend the pudding mix, whipped topping, and milk. Arrange a single layer of graham cracker squares in the bottom of a 13x9 inch baking pan. Evenly spread half of the pudding mixture over the crackers. Top with another layer of crackers and the remaining pudding mixture. Top with a final layer of graham crackers. Spread the frosting over the whole cake up to the edges of the pan. Cover, and chill at least 4 hours before serving.